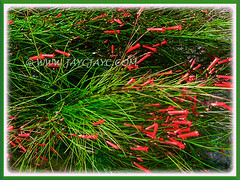 Fire Cracker Plant is an unusual flowering plant with fireworks-like blooms to light up any garden. A free-flowering beauty that blooms throughout the year in tropical and subtropical regions. 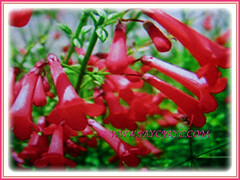 Its hanging clusters of scarlet tubular-shaped flowers is a sight for sore eyes. 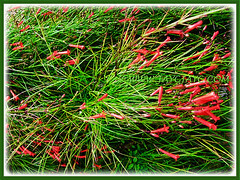 Botanical Name: Russelia equisetiformis (syn. : Russelia juncea). 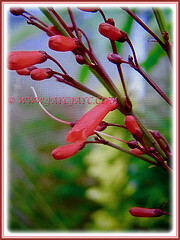 Common Names: Firecracker Plant, Coral Fountain/Plant, Fountain Plant, Coralblow. Etymology: The genus Russelia was named in honour of Scottish naturalist Alexander Russell (1715-1768). The specific epithet equisetiformis in Latin, refers to the plant’s resemblance to horse tail rushes. Origin: Native to Mexico and Guatemala. It is cultivated worldwide. Plant type: An ornamental perennial and weeping subshrub. Features: Russelia equisetiformis is from the genus, Russelia that consists of about 1,115 accepted species of flowering plants. A fast-growing perennial and weeping subshrub that reaches 1.8 m tall and a spread of 0.6 m. It is a multi-branching plant with 1.2-1.5 m long arching branches. The tiny bright green, oval-shaped leaves are scale-like and grow on thin, rush-like and wiry stems. 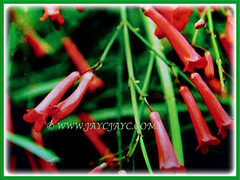 A prolific plant that produces hanging clusters of scarlet tubular flowers about 2.54 cm long that look like little firecrackers inspiring one of the plant’s common name, Firecracker Plant. 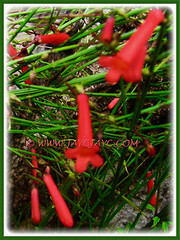 The fiery red flowers blast up and out in all different directions from the base plant. The tubular flowers, most common in red, resemble a fountain-like burst of fireworks that make this plant impressively showy. It flowers profusely with small decumbent blossoms. Eventually, the flowers will be followed by small, inconspicuous and brown-coloured oval-shaped fruits. 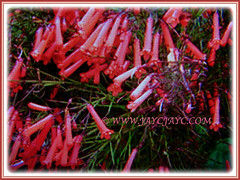 Culture (Care): Russelia equisetiformis or Coral Fountain can be easily grown with minimum maintenance. Light: Full sun to semi-shade. Does best in full sun for optimum growth and flowering. Moisture: Medium water needs. Water moderately and regularly to ensure that it thrives well. It is drought-tolerant once established. Soil: Humus-enriched, loamy and well-drained soils. Others: Deadhead regularly to keep the plant looking aesthetically pleasing and to encourage more flowers. Trim the growing tips often to control its size and to keep it shapely. Cut back too tall and wayward shoots to stimulate strong growth. Also, remove the dry twigs regularly. Feed once monthly with a liquid fertilizer to encourage blooming. Generally free from serious pests and diseases. However, do watch out for mites, chewing insects and nematodes. For subtropical and temperate regions: Hardiness: USDA Zone 9 – 11. 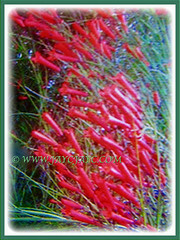 Russelia equisetiformis or Coral Fountain can withstand temperatures down to -6.6°C. In colder climates, grow it in a container and bring inside to overwinter as a houseplant in bright locations. A tender perennial to be planted out well after your last frost date. These easy-care subshrub blooms continuously from spring to fall with occasional deadheading. If plant is damage by cold, trim stems sparingly to stimulate new growth. It does best in a location protected from strong winds. They’re evergreen unless winter is harsh, and can thin out and look somewhat scraggly in cold weather. Feed 3 times annually during spring, summer and fall with a controlled-release fertilizer. Propagation: Easily propagated from tip cuttings. 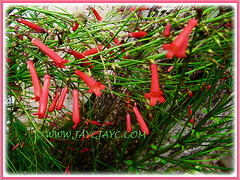 Usage: Russelia equisetiformis or Firecracker Plant with its ornamental and fiery red flowers will be excellent when espaliered on a trellis or at a balcony. Suitable in hanging baskets and raised beds with their cascading stems. Ideal for container planting or raised planters outdoors and indoors as the firecracker’s flowers will drape beautifully over the sides like a fountain. Sometimes it is used to hide unattractive retaining walls or fences with their dense foliage. 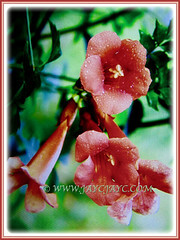 A very popular nectar plant for hummingbirds, butterflies and insects such as bees. Splendid Euphorbia milii in exotic and bizarre colors!